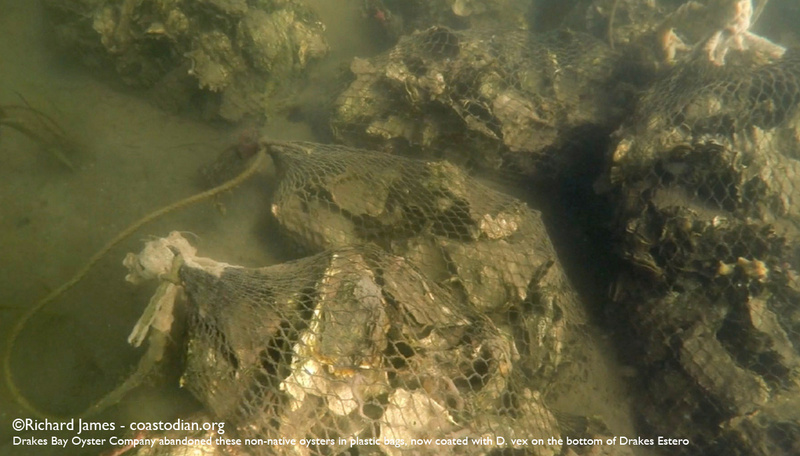 Please click the words above “Sustainable Oyster Farming, DBOC style ….” to see this entire post. 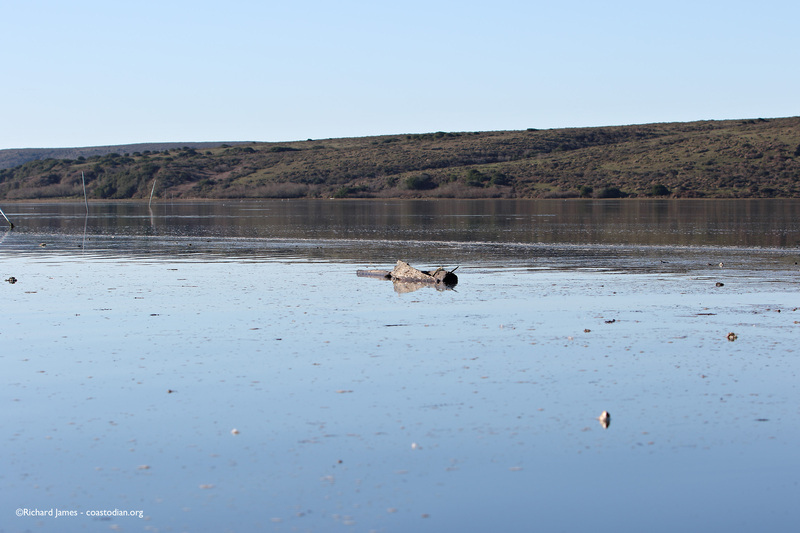 1 January came around and I had no choice but to go enjoy the first day of an unimproved Estero. The first thing to catch one’s eye is the new sign out on SFD…. Driving down to the put-in, the empty parking-lot surprised me, not another boater out enjoying this auspicious new year. 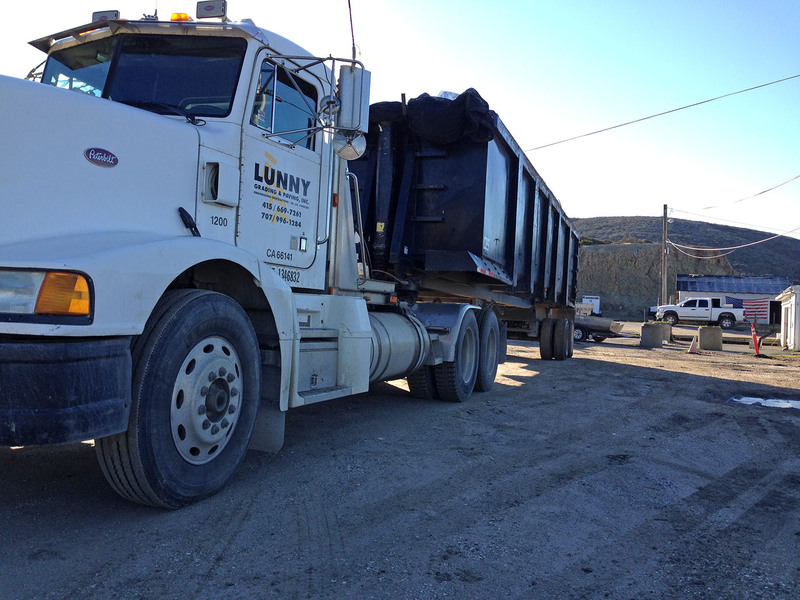 There was a large truck poised to haul out another load of stewardship. Unloading my boat, odd specks in the water caught my eye. Remains of a barge DBOC crushed into pieces while in the Estero so they could remove it. 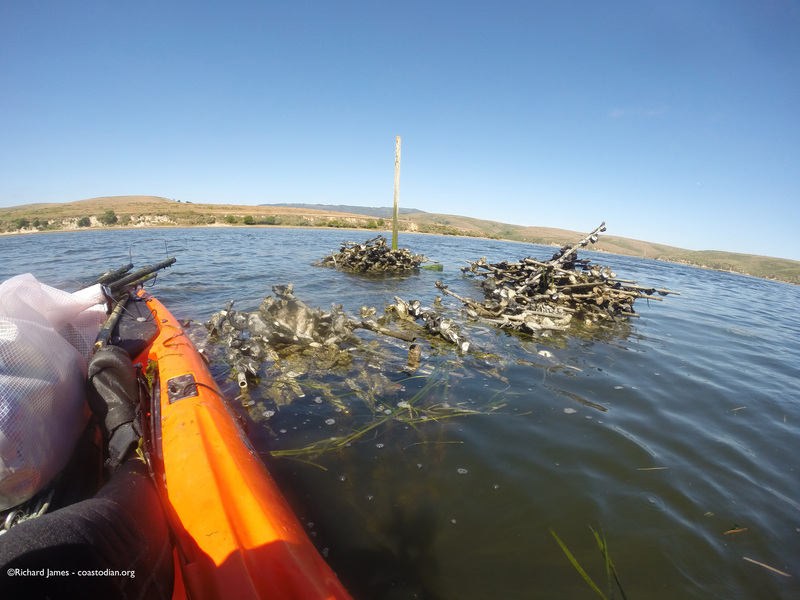 Too bad they left thousands of pieces of foam to further pollute The Estero. 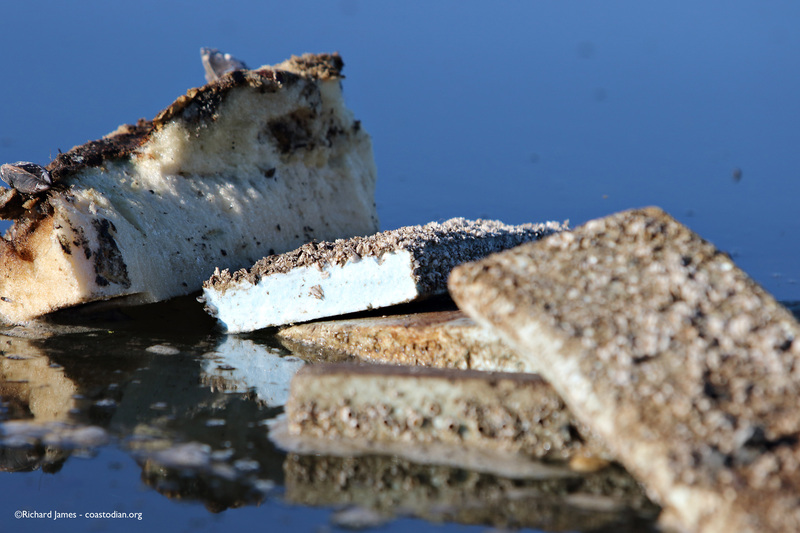 Wow, it looked as if they had destroyed one of their barges and left the shards of foam as one last gift. 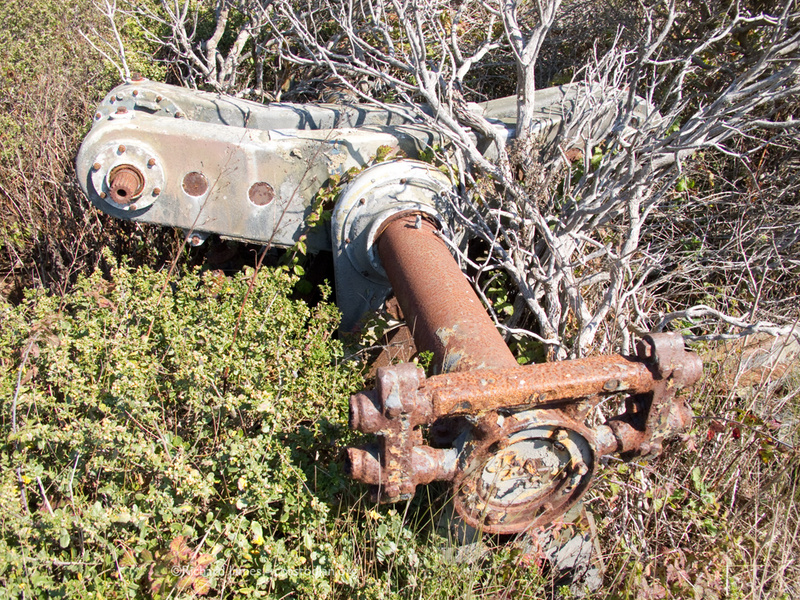 After putting my boat in the water and paddling around to photograph the mess, the truck driver on-shore informed me that they had indeed crushed a barge into pieces so they could lift it out of the water. He then asked me if I could fetch the large wooden piece of barge still floating in The Estero and bring it to him so he could take care of that. I said sure and paddled over to it, threw a leg over it and paddled to shore dragging what must have weighed a few hundred pounds. He thanked me, as did I him. 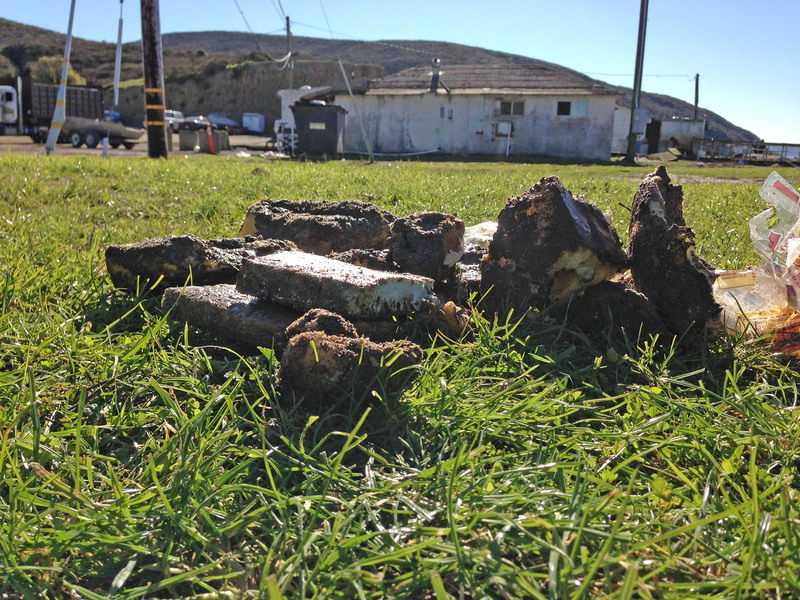 After reading the comments made by one of the managers of DBOC at the “wake” held Saturday in Point Reyes Station, “The company, which also raised Manilla clams, has removed every oyster from the water in compliance with the terms of the settlement, according to Ginny Cummings, the farm’s manager. I can confirm that the same care was used in dismantling the operation as was used in running it. 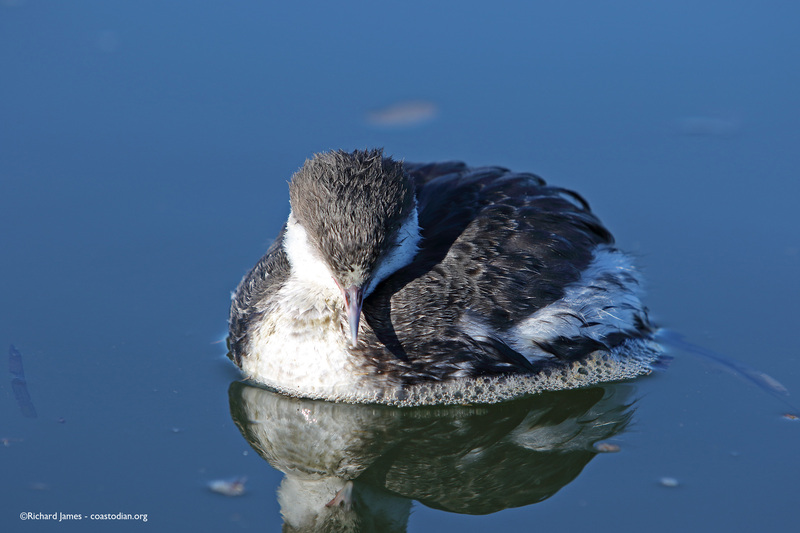 As I returned from my short boating excursion, paddling against the strong ebb tide, thousands upon thousands of chunks of foam drifted with the tide, towards the mouth of The Estero. 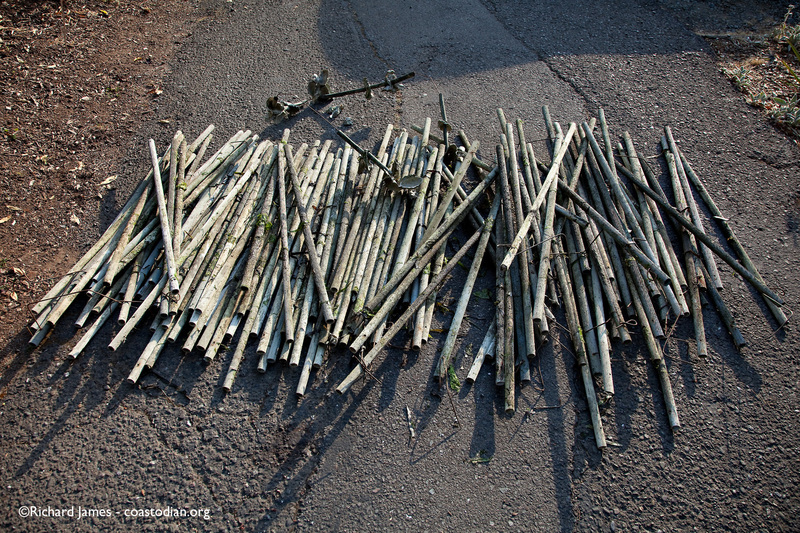 I picked up a few dozen of the larger pieces as I hurried ashore to meet a dear friend who was coming to visit. 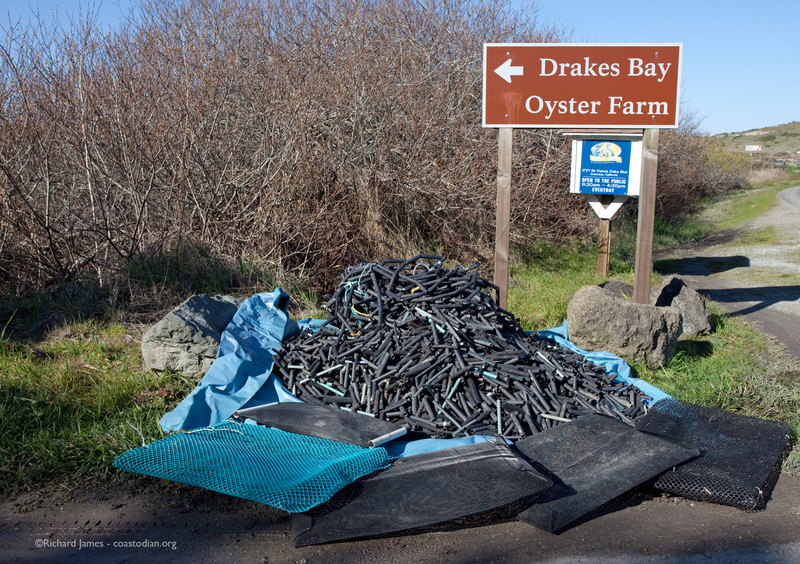 Thankfully, the variety of stewardship practiced by The Drakes Bay Oyster Company, and their workers for the past 30+ years will no longer impact a landscape that needs no improving whatsoever. 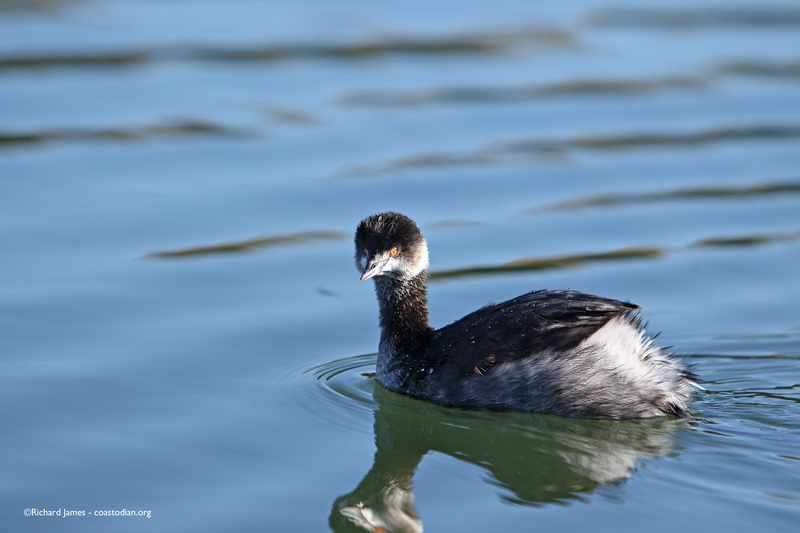 The grebes seen below can once again be grebes, unencumbered by the deep respect of DBOC. 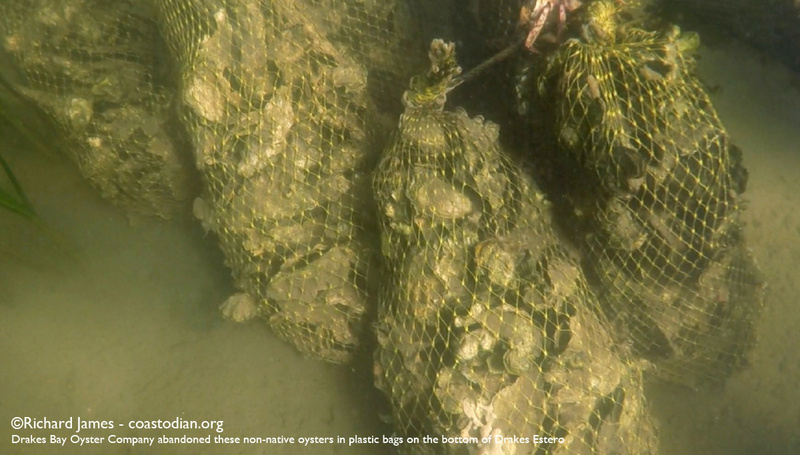 Click the words above “Sustainable Oyster Farming…” to see this entire post. 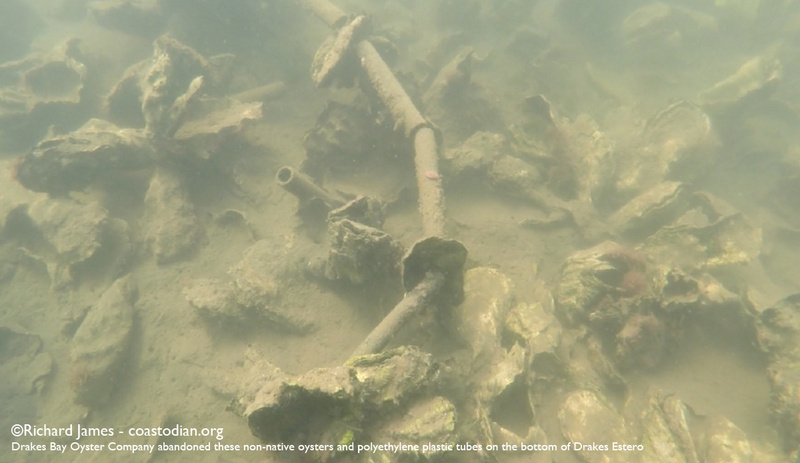 In particular, the banner image that shows two of the miles of racks in Drakes Estero, upon which I have placed several plastic bags filled with oyster shells that I found on the bottom, directly below the where they sit in this image. 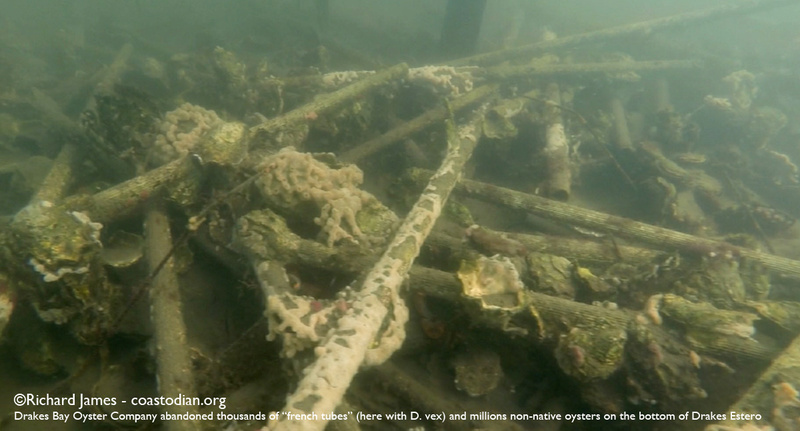 Earlier this month I spent a few hours recording the mess left behind by DBOC under the oyster racks in Home Bay. 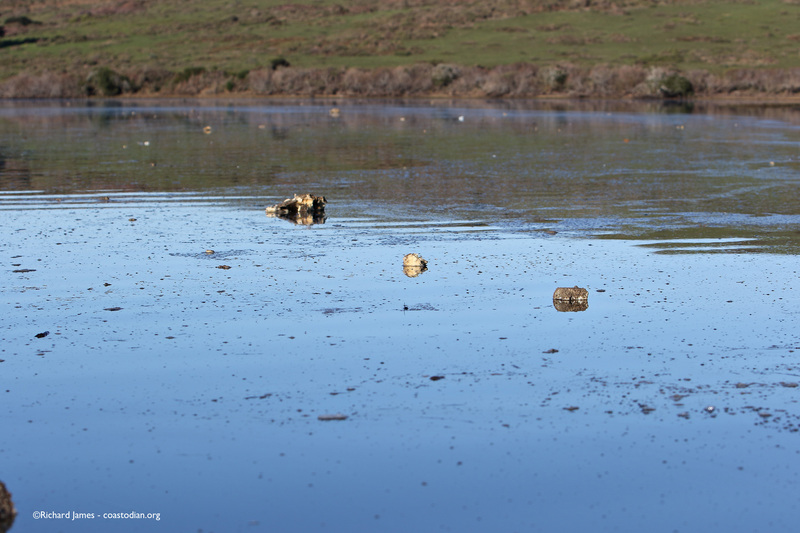 No surprises, simply more of the same disgraceful mess left behind by a firm that repeatedly touted itself as a steward of the land, with deep respect for the waters of The Estero. Below is three brief minutes from hours of video I recorded. Be sure to click the small rectangular icon in the lower right corner of the video window so you can see this HD footage fill up your screen. That way you’ll have a better idea of how the floor of Drakes Estero is filled with the remnants of a farce, foisted on us all as the model of sustainable farming. 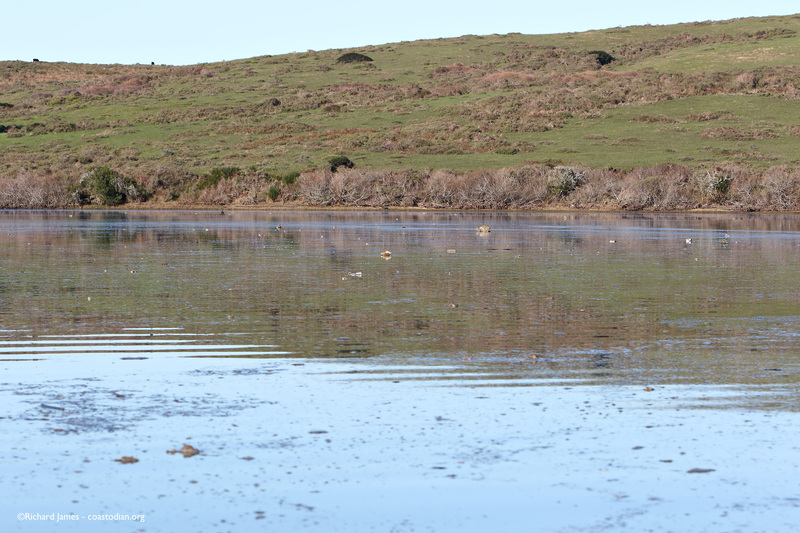 Sustainable Oyster Farming, West Marin Style – You think you’re doing something good…. 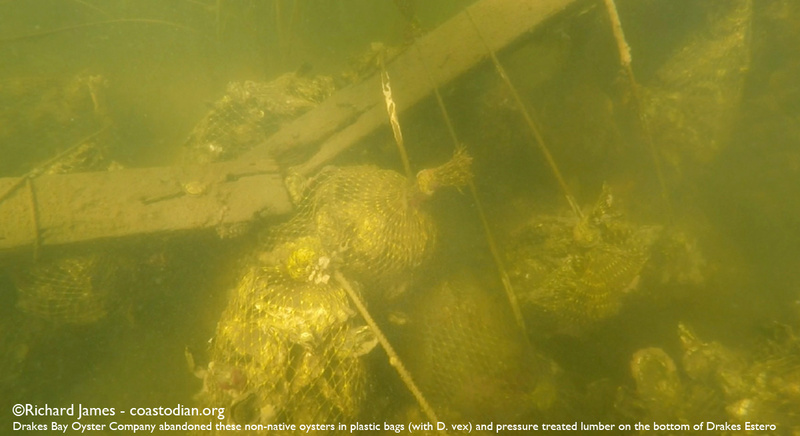 Click on the words above “Sustainable Oyster Farming, West Marin Style ….” to see this entire post. 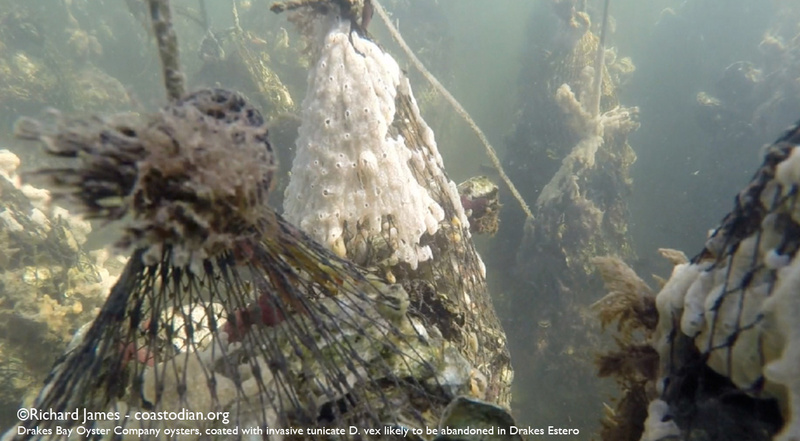 Lately I’ve been boating and diving various areas of Drakes Estero in order to get a handle on how enormous of a mess is being left by Drakes Bay Oyster Company. I assure you, it is a disaster out there. For them to suggest that the cleanup cost would be only $10,000 (which they did, more than once), is one mighty big whopper! After diving under 8 long racks today, over one half mile of lineal rack space, I put up my sail and let the wind drive me back to the put in near the oyster processing facility. As I pulled my boat out of the water, the manager of DBOC approached me, saying she had a couple questions she’d like to ask me. I said sure. “What you are doing would be like me taking your boat and putting it in my car,” she said to me. I will digress for a moment to correct her remark, given all that has transpired over the past almost two years. She thinks that my picking up the mess that DBOC has been leaving in Drakes Estero for the past six and a half years or so, is like her stealing my kayak. 1 I signed a contract with a landlord to lease a place to store my kayak and was told that after 7 years, I could no longer store my kayak there. 2 During the lease, I enlisted the help of all manner of politicians, lobbyists and other groups to put pressure on the landlord to extend my lease. 3 At the end of my lease, the “home-owners association” that my landlord belonged to told me my lease would not be extended. 4 I sued the landlord and HOA. The court hearing the case rejected my claim. 5 I appealed my case to a higher court, they too, rejected my case. 6 I appealed my case to the entire bench of said higher court, they rejected my claim. 7 I appealed my claim to the Supreme Court of the United States, they refused to hear my case. 8 Lots of my buddies sued on my behalf, trying to get my lease to store my kayak extended. That case was tossed out, my buddies were scolded. 9 For the nearly 2 years I was fighting against the lease I signed, I continued to store my kayak, yet did not pay rent. And I earned income renting out my kayak to others. And then, I ran my kayak through a shredder and left all the pieces scattered about the place I had leased. Yeah, I can see how my picking up the abandoned mess left by DBOC is just like her stealing my kayak. “I’ll stop placing tubes on top of the racks”, I said. “Are you going to pick up all the live oysters from off the bottom?” I asked her. “You still haven’t answered my question. I’m gonna stop placing french tubes on top of the racks, are you going to pick up all the live oysters off the bottom of The Estero?” I asked for a third time. Below are images from what I saw today. 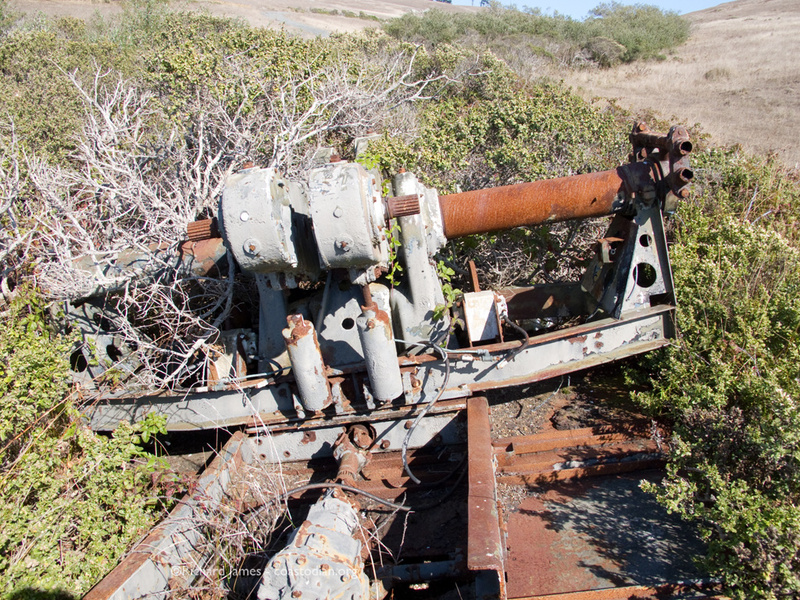 They represent a fraction of the disaster left by DBOC on the bottom of Drakes Estero. All images ©Richard James and may not be used or reproduced without written permission. Whose job is it anyhow….? Click the words above “Whose job is it anyhow…. ?” to see this entire post. 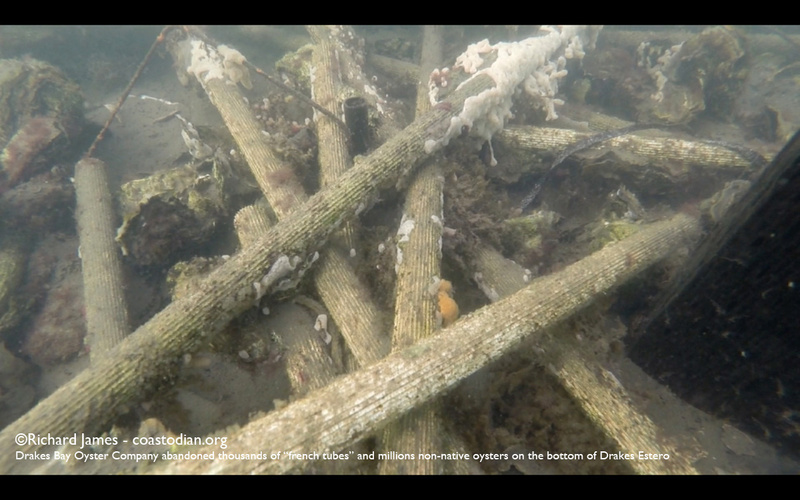 Can anyone tell me whose job is it to ensure that the mess left by The Drakes Bay Oyster Company gets cleaned up? I’ve asked people at the California Coastal Commission, Department of Fish & Wildlife and the National Park Service this very question. Twice! I’ve not heard a peep from anyone, after nearly two weeks. It seems important to find out whose job it is. 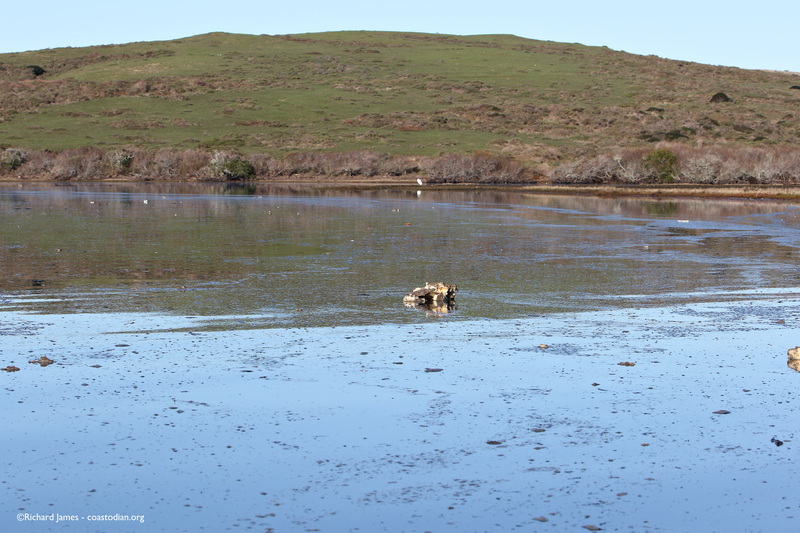 In the past, when oyster leases changed hands in West Marin, or operations shut down, big messes get left – see images below. 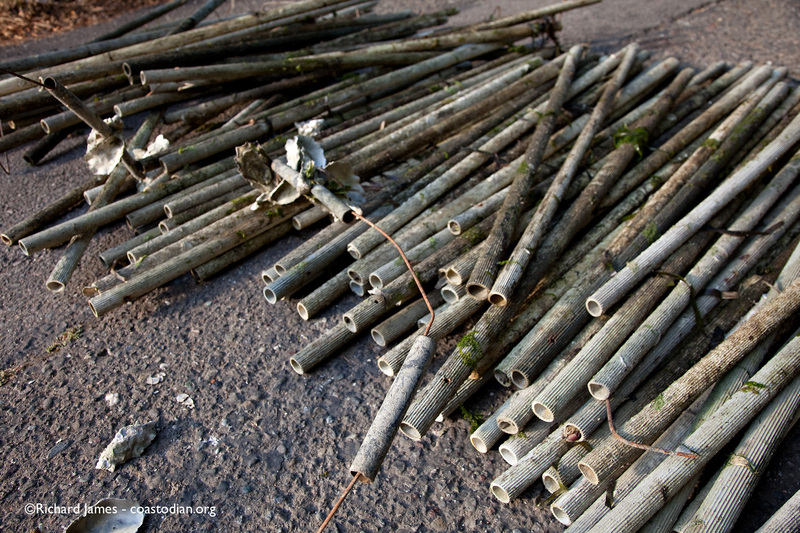 All those years profits being made, and every time, the earth gets left holding the [grow-out]bag, [polyethylene]tube, [nylon]rope, [PVC]pipe, zip-tie etc…. As always, click on a picture to see a larger version. 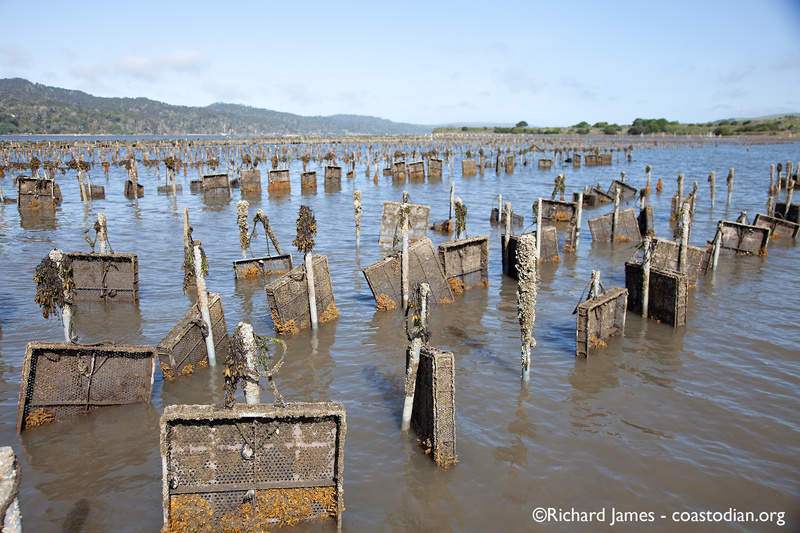 Sustainable oyster farming, West Marin style. Above is what Charlie Johnson (and now Kevin Lunny) want to gift to the planet. No thanks, please clean up YOUR mess. 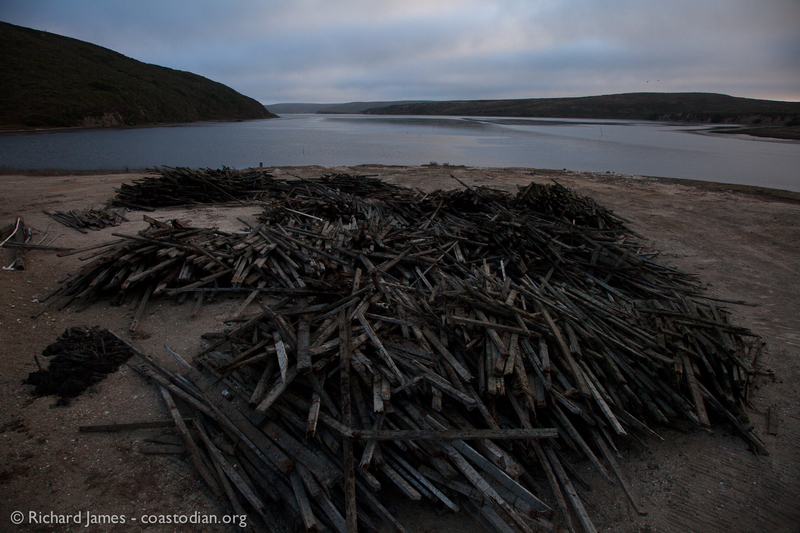 Some of the hundreds, likely thousands of “french tubes” left to rot on the floor of Drakes Estero by DBOC. 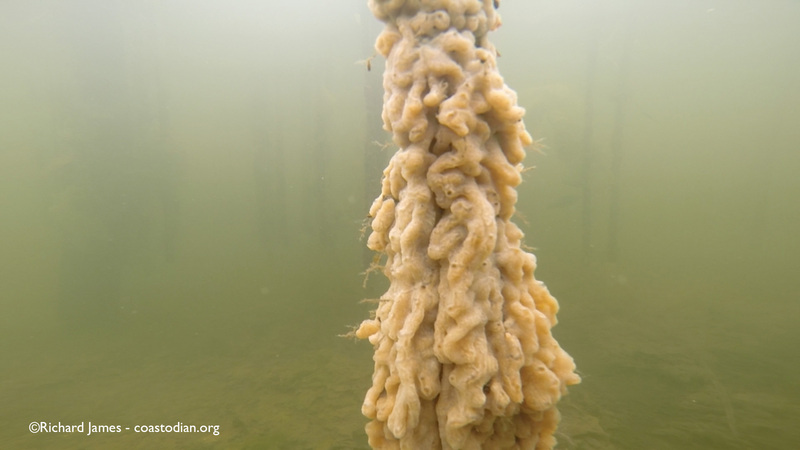 One string of oysters covered with non-native, invasive tunicate D. vexilium. 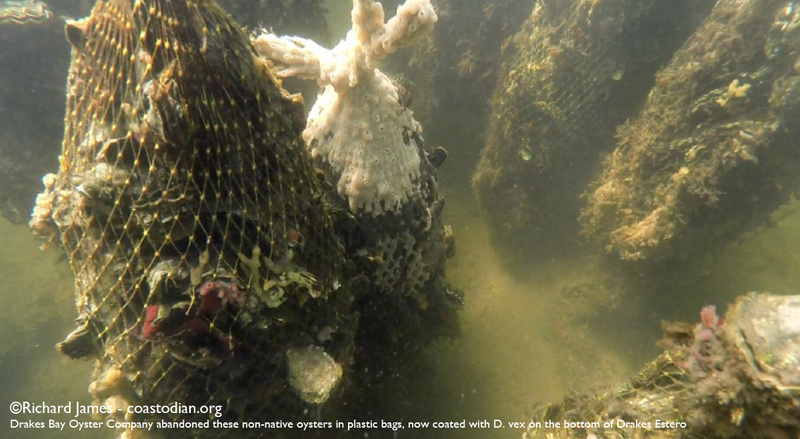 There are many dozens, possibly hundreds more just like this, left in Drakes Estero by DBOC. 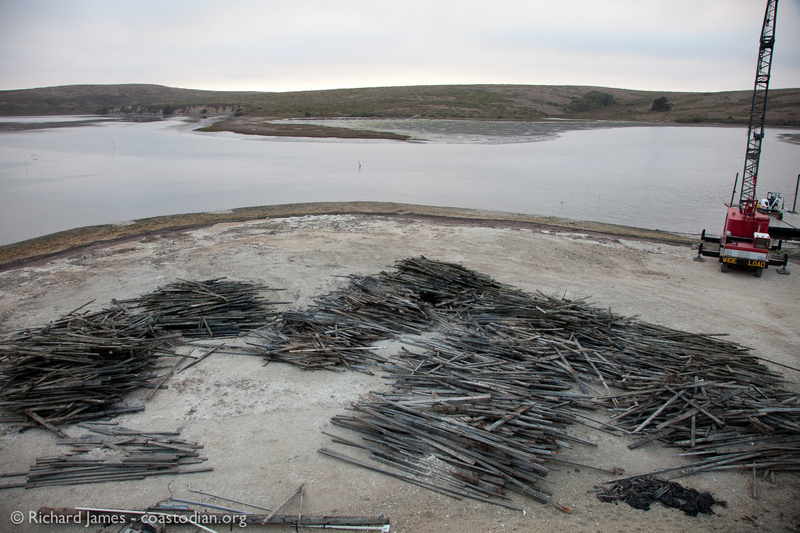 Above are iron oyster racks, likely from Drew Alden, left in the southern Tomales Bay lease now operated by Todd Friend at TBOC. Above was left when Drew Alden sold his lease to Todd Friend over 5 years ago. 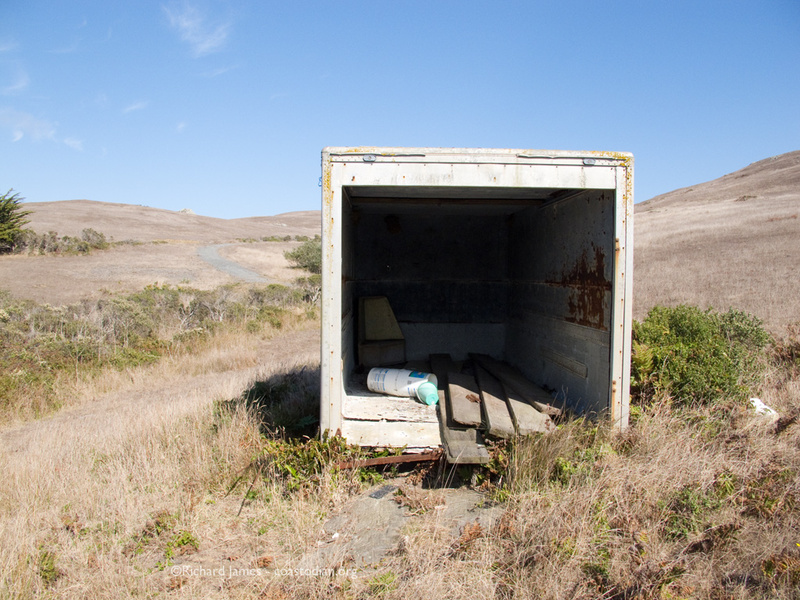 Why is this mess still disgracing Tomales Bay? 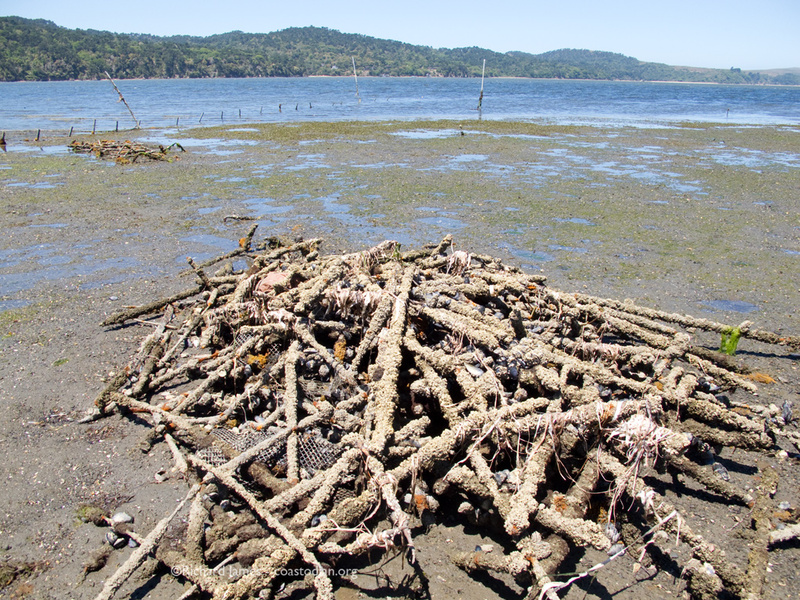 Not sure who so generously left this mess in Tomales Bay. 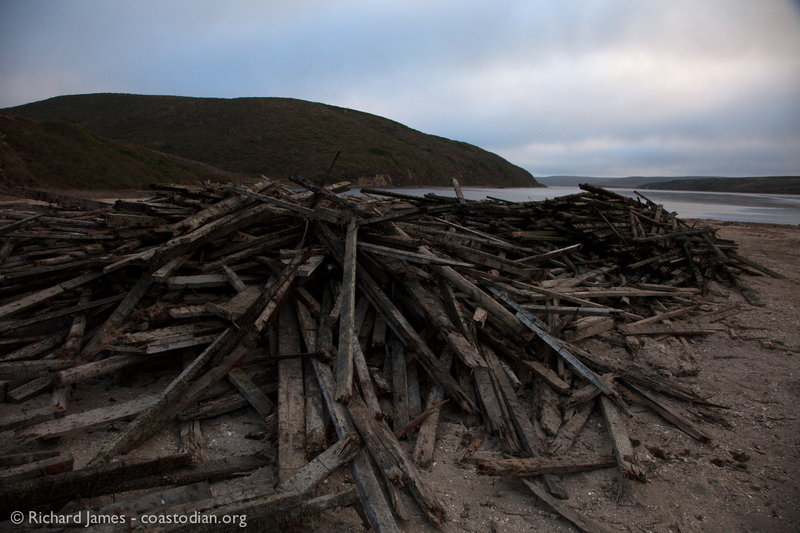 On the eastern shore of Tomales Bay, north of Walker Creek you’ll find this mess from oyster operations begun and abruptly ended decades ago. 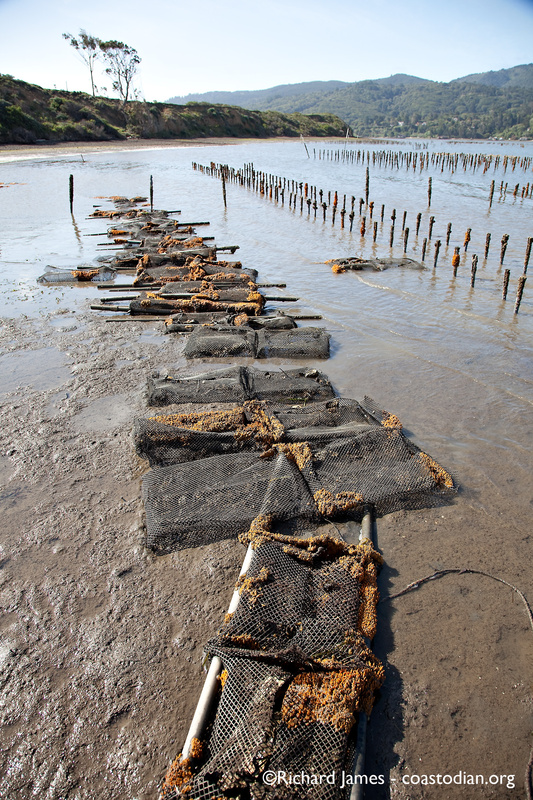 If people want to make an honest buck farming oysters, that is fine by me. It is hard work, no question about that. But, taking shortcuts, short-sighted business practices and just plain arrogance has been trashing the planet. The disgraceful disaster scattered on the bottom of the thousand acre lease of precious Drakes Estero is at zero to ten feet below sea level usually. 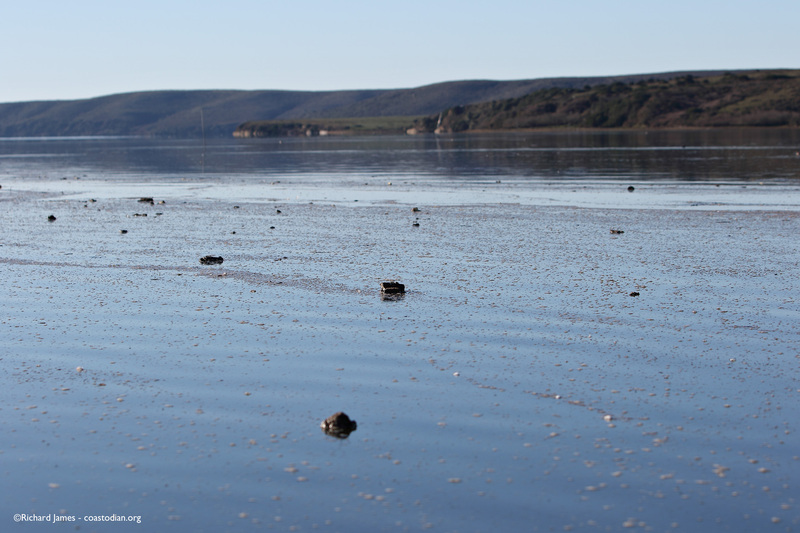 We now have an opportunity to see the stewards of the land, with a deep respect for the waters of Drakes Estero show us just how deep their respect is. Sunday the 20th found me out on Drakes Estero on a superb day to enjoy this wilderness jewel. A light south headwind on my paddle out made for a light tailwind, coupled with a strong flood tide to push me back after a day diving to see what lay beneath the surface. 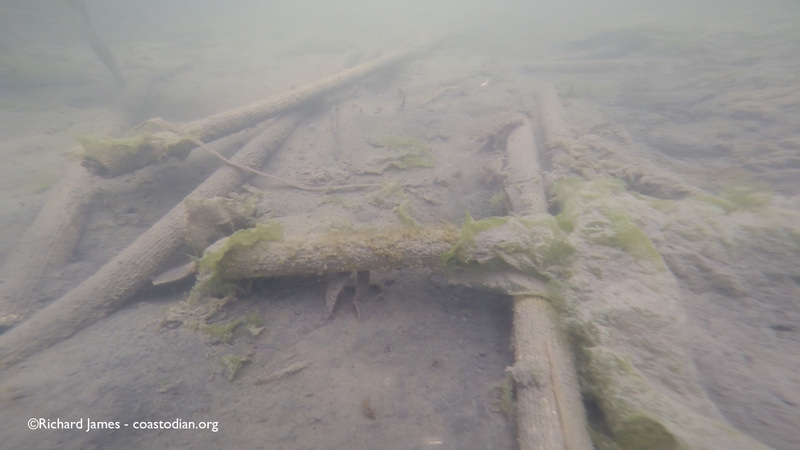 Having replaced my polarized glasses I’d broken two years ago, this was my first time boating on The Estero with the ability to easily see underwater. 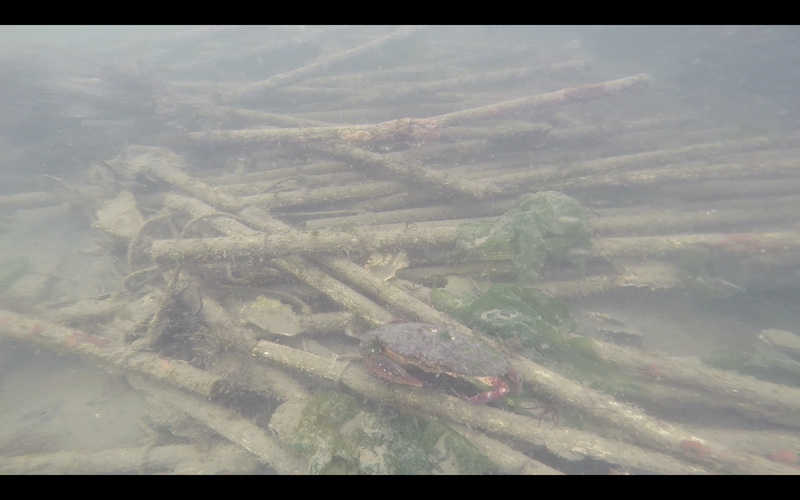 An amazing world of kelp, eal-grass, nudibranchs, bat rays, leopard sharks, fish and crabs all went about their business of eating, trying not to be eaten and reproducing. 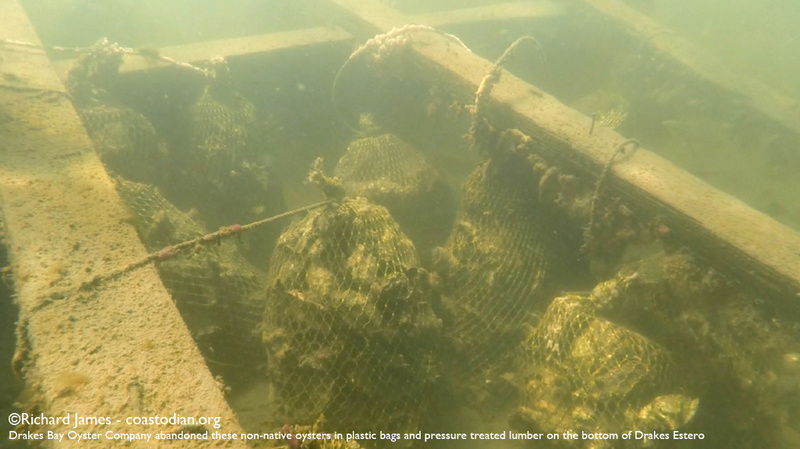 Sadly, after years of use by a “Sustainable, respectful of the land oyster farm”, the Estero floor is now littered with abandoned plastic, oyster shells and lumber treated with toxic chemicals. 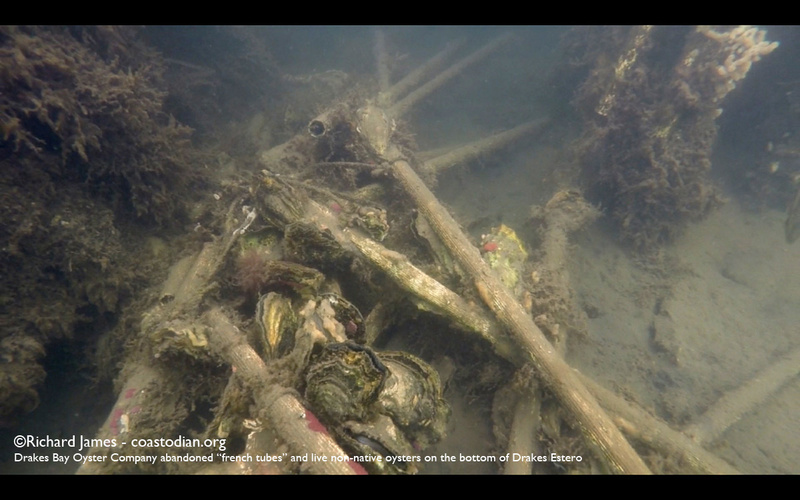 Thankfully, Drakes Bay Oyster Company has a “deep respect for the land and waters of the Estero ecostystem”. 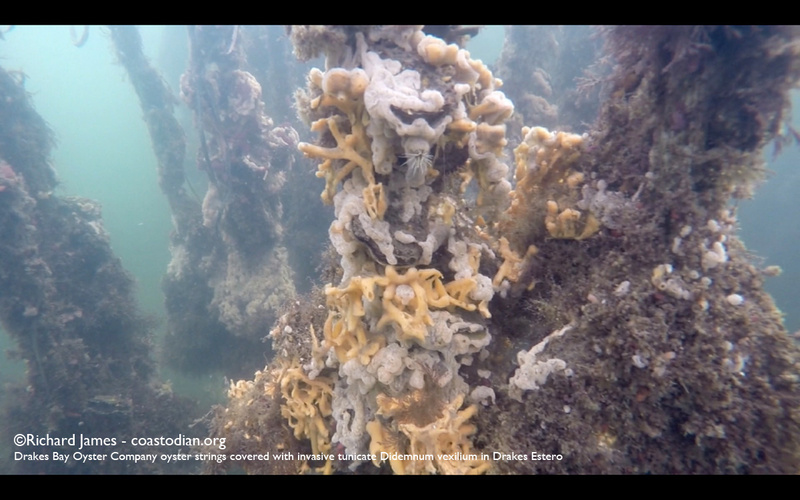 Just imagine what the place would look like if some company without such strong morals had been running the show…..
Below is a 7 minute view of Drakes Estero, below the surface. It is High Definition, so click the small rectangle in the lower right corner of the video window to fill your screen, especially nice when the large shark comes into view. 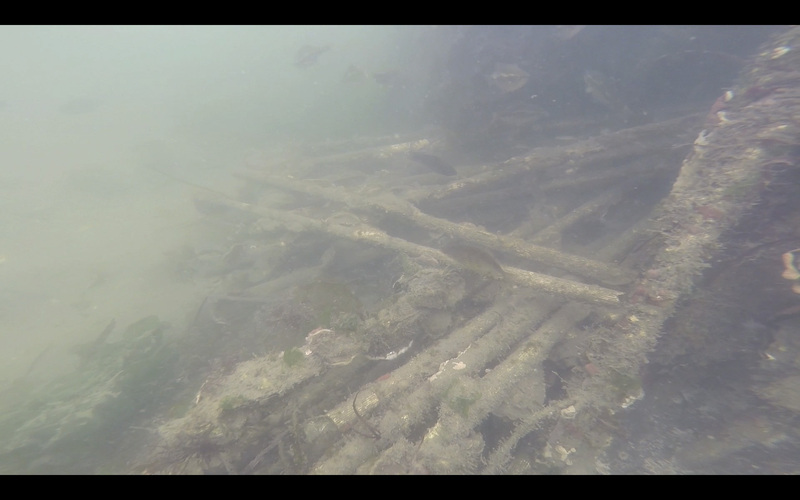 While not the best footage (drifting with the tide holding a camera on a pole), it does give an accurate representation of what, sadly, is found under many of the oyster racks encroaching on The Estero. 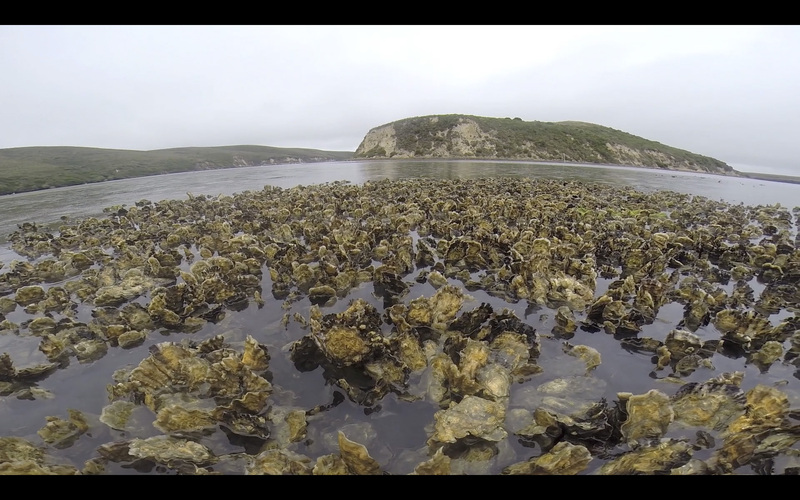 As my camera skills develop, I plan to venture out to the northern part of Tomales Bay and share equally disturbing views of the side-effects from years of resource extraction in those waters. 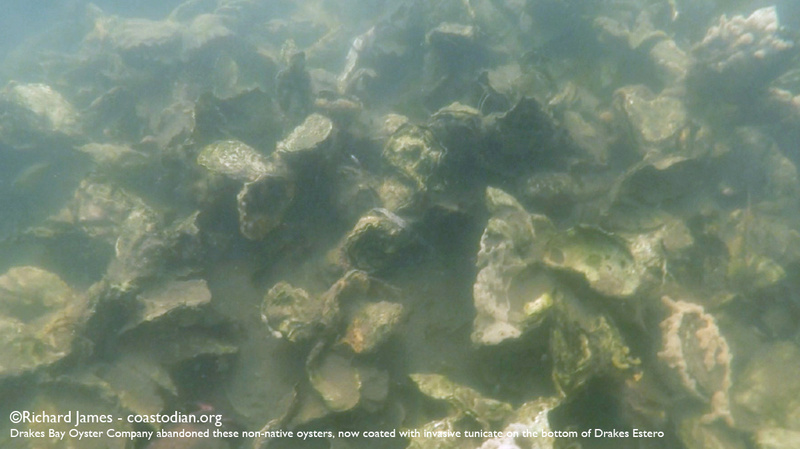 Click on the words above “Sustainable Oyster Farming…” to see this entire post. NOTE: Those of you that come back to this page again and again, please consider adding a thoughtful comment. This page is meant to stimulate public discourse on the situation at hand. 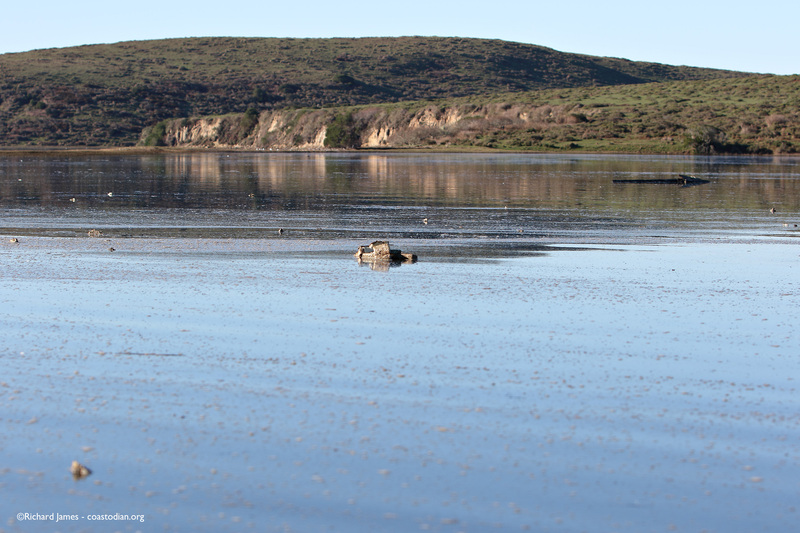 July 1st was the first day to go boating on Drakes Estero since the closure to protect Harbor Seals began on March 1st. I had not been out there since February and really wanted to go visit this special place again. 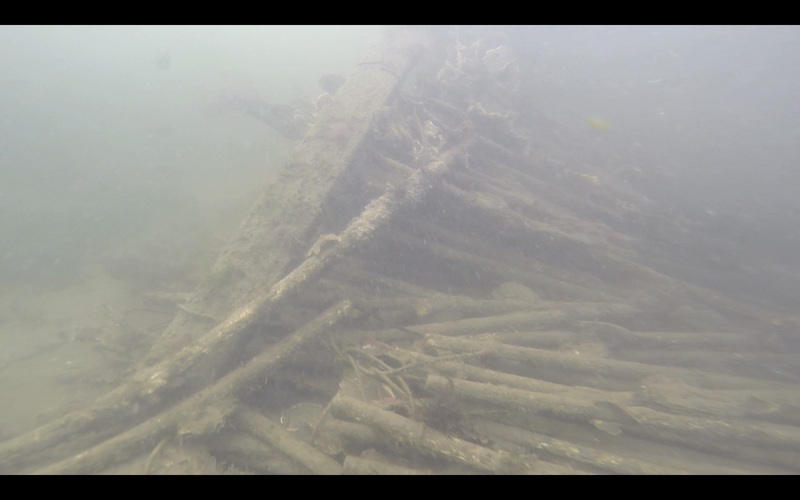 On July 6th I took my boat and cameras out to visit the same oyster racks I described in an earlier post here. I wanted to see if any clean-up had been done since my last visit. 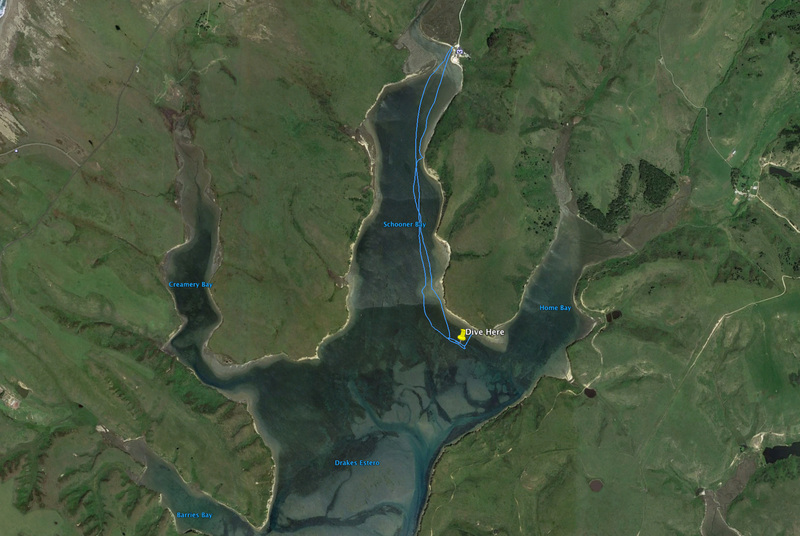 The location of the two oyster racks I visited are just outside the mouth of Home Bay and can be seen in the image below. 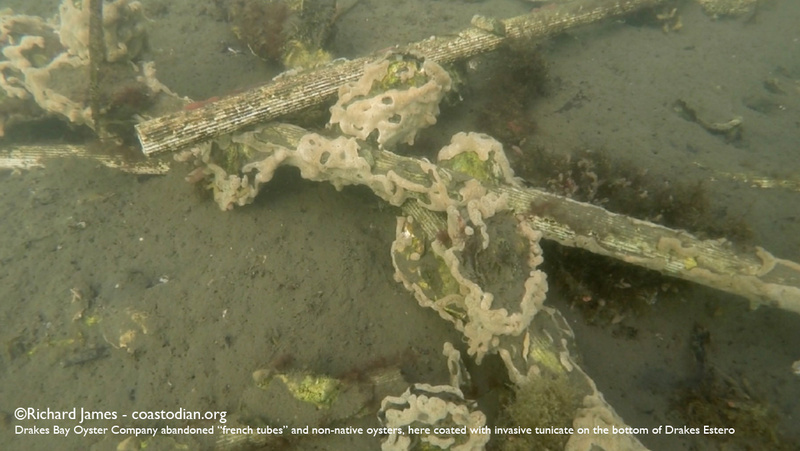 The first rack I dove near was nearly half occupied with “french tubes”, long white tubes upon which oysters grow directly. 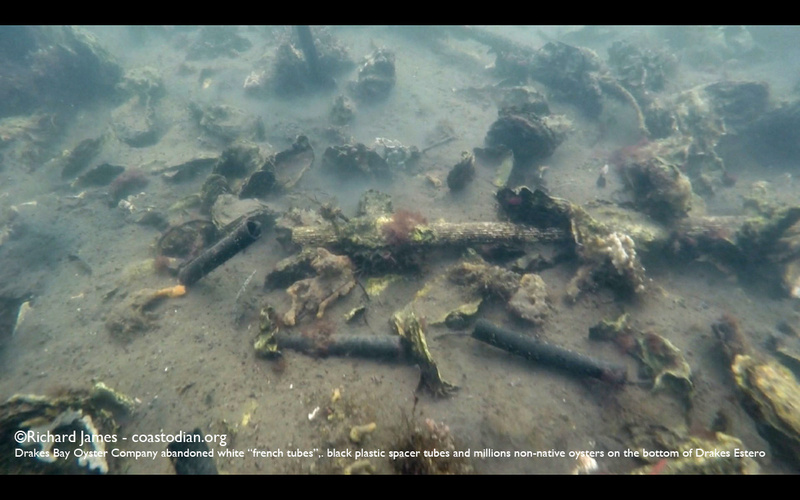 The other half of the rack was partially occupied with the older style “black spacer tubes” [see a pile of over 5000 of these tubes I picked up on Point Reyes Beaches here], and partially devoid of tubes of any kind. What I saw on the bottom under the french tube area shocked me, it was worse than I imagined. 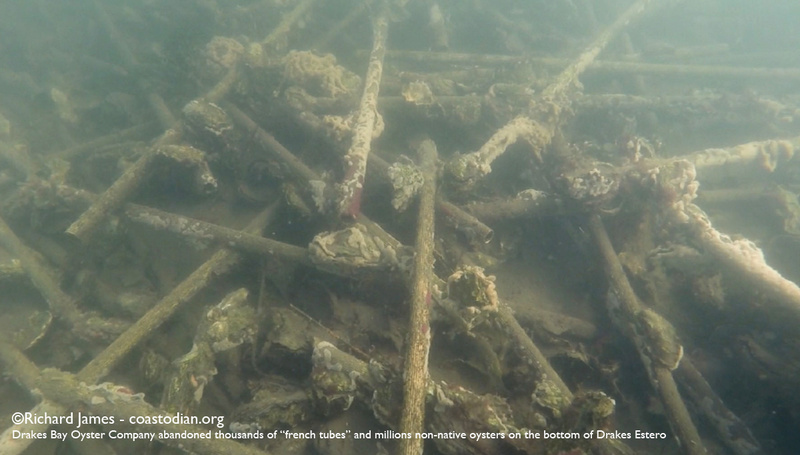 I pulled from the bottom, 136 french tubes, all of which were devoid of oysters, but a fraction of what is down there. Below are still images and a video of what I saw. 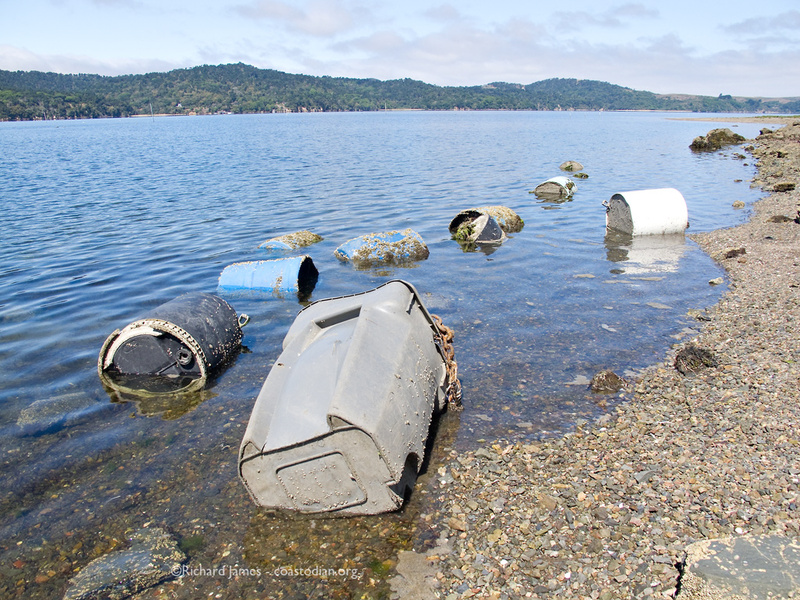 Those tasked with cleaning up the mess of the Drakes Bay Oyster Company have their work cut out for them. 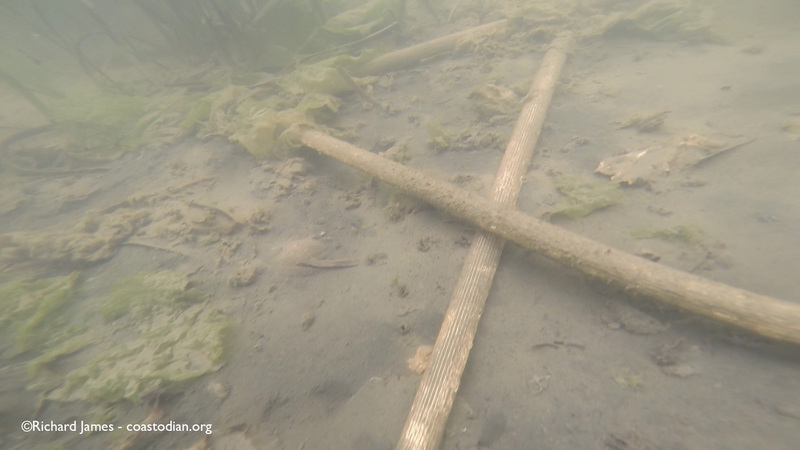 Each tube I dug out of the mud clouded the water instantly, reducing visibility to nearly zero. In a little over 3 hours, I collected the 136 tubes from under half of one rack, and I estimate 60-70 tubes from under only 20 lineal feet of the adjacent rack. Even with dive gloves on, my fingers bled again and again from the numerous cuts caused by razor sharp oyster shells. 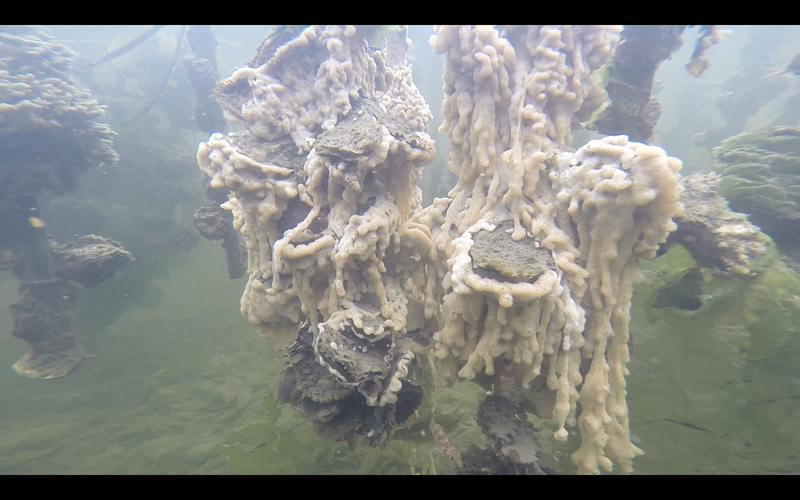 I was unable to load the other 60-70 tubes on my boat, as they were encrusted with mostly dead oysters. I stacked those on top of the racks above where I found them in the mud. Didemnum vexillum. 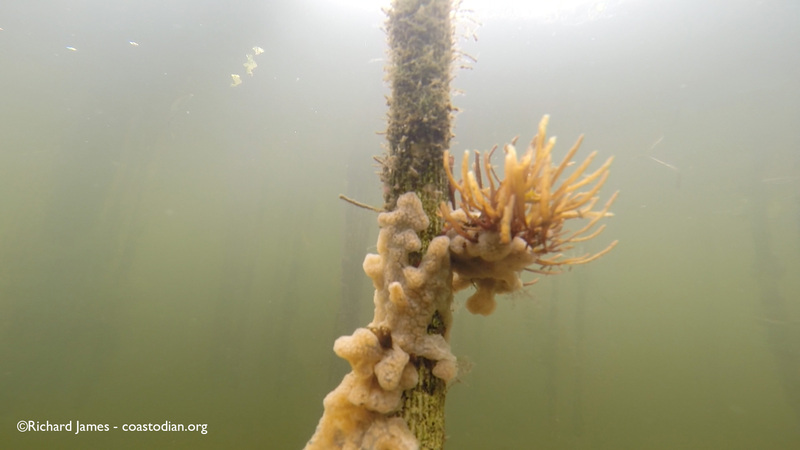 invasive tunicate growing on a suspended oyster growing device called a french tube. Click on the words above “Cert. denied” to see this entire post. The supreme court issued their orders this morning. 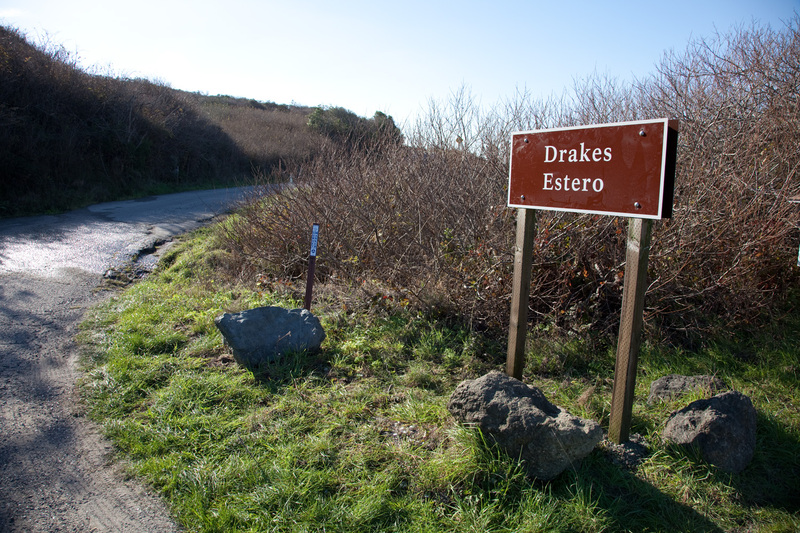 On the list of cases denied a hearing, Drakes Bay Oyster Company. Now to get DBOC to clean up the mess they bought/created along with the lease. 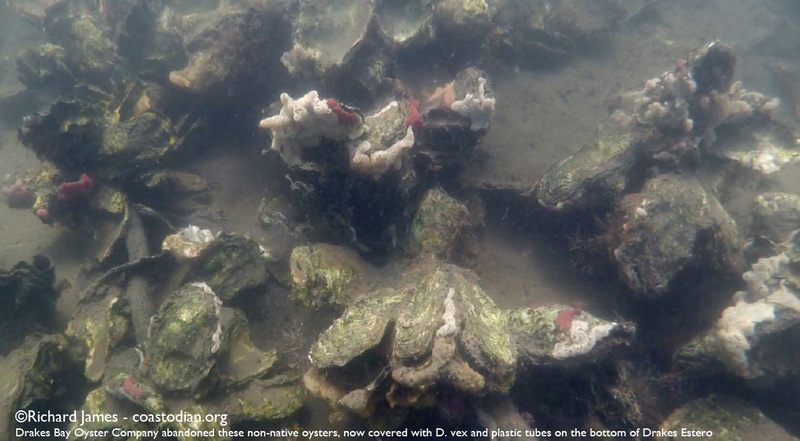 Let’s hope they break with what seems to be the tradition of the oyster industry and actually do the right thing and clean up the mess they made while making a profit from the public waters of the State of California. 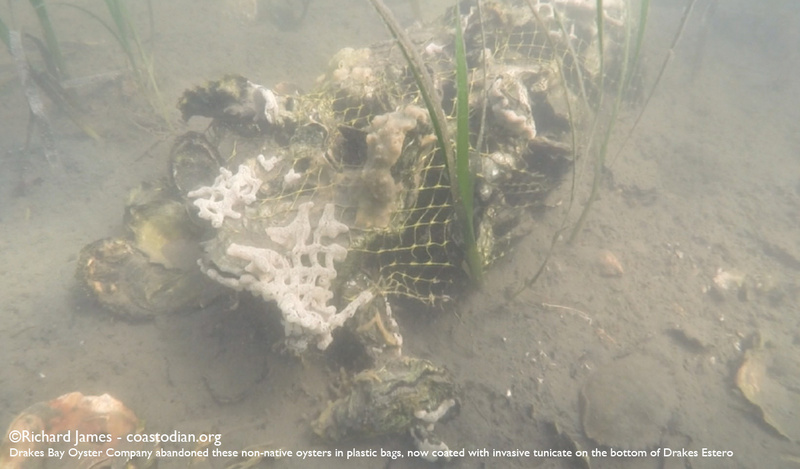 Read about other local oyster growers and the mess they either created, bought, continue to create or are beginning to clean up, here, here, here and here.